As your company begins to grow and you find yourself expanding outward into new spaces and into new buildings, a folding room screen divider can be an important tool to aid in organizing and dividing your office space. We at Cubiture have a large array of partitions, walls, and screens that help to give new form to any office space as your company operates within it. Folding room screen dividers are beneficial in many types of office settings. It’s nothing new for a company in any industry to divide their office space into smaller, more functional zones. Often, an office might not have sufficient amenities to offer a comfortable place to work. There may not be any formal rooms for private offices, or maybe you’re lacking in a conference room. Perhaps your break room is part of an open-plan office that has no hint of privacy at all. Whether left as a continuous fixture or occasionally deployed for when needed, a folding room screen divider can offer the necessary delineation between two zones of different functions. This may mean that you can get a bit of relief from the rest of your coworkers as you take your break behind a screen separating work space from the kitchen counter. Folding room screen dividers can also separate employees at work from each other to grant a little privacy, or they can conversely bring employees together for meaningful collaboration on a team project or within a particular department. Folding room screen dividers should also offer a degree of sound privacy since even in open-plan offices its been found that concentration and focus are very necessary. Many of our dividers are made of two-inch-thick acoustical fabric panels that help to dampen sound and protect the users within the space from noise distraction. This fabric also accepts push pins, if for any reason you feel that your dividers can serve an additional role as a bulletin board. We offer a wall-mounted, floor-based partition that doesn’t need a track as its according, or folding, panels move to regulate the break between two office spaces. This is an excellent option for when you need a more “permanent” folding room screen divider to break up large open-plan offices. Reaching up to 12’ in height, it can truly mimic a conventional wall. Without a track needed at the ceiling, any air circulation from your building’s HVAC system has no difficulty in flowing freely between the two spaces your divider has created. This type of divider tends to be lower in cost than the more dated and expensive accordion wall systems that require a track to mount to. We also carry “360 accordion dividers” that feature a 360-degree hinge allowing for a full range of motion and therefore several setup options that respond to unique spatial situations. Its strong but lightweight extruded aluminum frame allows for ease of movement atop lockable casters. If you’re interested in this folding room screen divider but you’re on a budget, we also carry a folding room screen divider made of canvas. While not absorbing sound as effectively as the “360 accordion divider,” it still possesses many of the same great features. Don’t confuse this economical product as a poorly-made one. It’s highly durable and lightweight, constructed with 16-gauge round steel tubing that’s connected with plastic corner joints. It also has the same 360-degree hinges that the “360 accordion divider” has, giving it a number of fun setup options to choose from. The full-sized end panels include Velcro fasteners if you ever want to attach multiple folding room screen dividers together. The beauty of these folding room screen dividers is that they can contribute to a visually dynamic space. Within our available selection, and depending on the style of divider you prefer, there is a vast array of different colors available ranging from bold and whimsical to muted and natural. You don’t have to opt for a boring office space that just uses folding room screen dividers for a utilitarian zoning purpose. You can also add a touch of style that reflects the value and personality of your business. For a lot of people, folding dividers might even connote a sense of warmth, as they’re reminded of their more ornate counterparts seen in private bedrooms. In fact, we do carry brown wicker partitions that imbue a sense of earthiness for when you want to give your office a warm touch. Available in 6-foot and 10-foot lengths, you can combine several of these unique folding room screen dividers to provide adequate visual privacy to any size space. 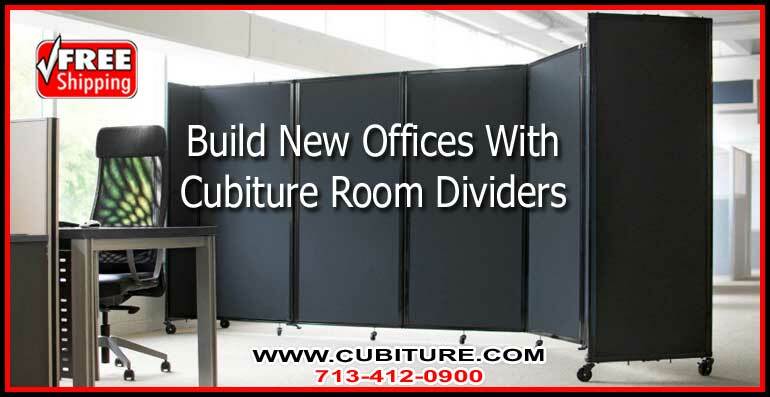 Don’t wait call Cubiture today and see how we can guide you in selecting the perfect folding room screen dividers for all your office zoning needs. You can also ask about our free, no-obligation space planning services, where we can help you determine how best to make use of your office space with your new folding room screen dividers.